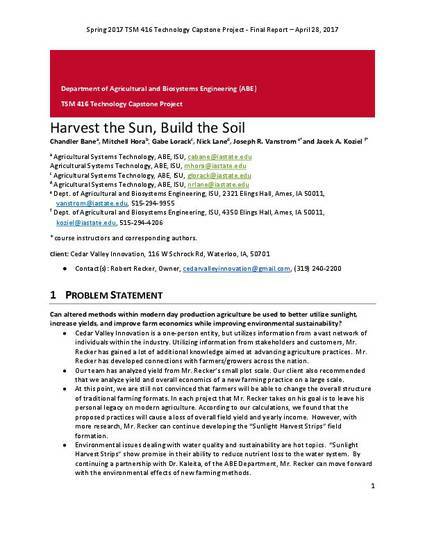 Can altered methods within modern day production agriculture be used to better utilize sunlight, increase yields, and improve farm economics while improving environmental sustainability? Cedar Valley Innovation is a one-person entity, but utilizes information from a vast network of individuals within the industry. Utilizing information from stakeholders and customers, Mr. Recker has gained a lot of additional knowledge aimed at advancing agriculture practices. Mr. Recker has developed connections with farmers/growers across the nation. Our team has analyzed yield from Mr. Recker’s small plot scale. Our client also recommended that we analyze yield and overall economics of a new farming practice on a large scale. At this point, we are still not convinced that farmers will be able to change the overall structure of traditional farming formats. In each project that Mr. Recker takes on his goal is to leave his personal legacy on modern agriculture. According to our calculations, we found that the proposed practices will cause a loss of overall field yield and yearly income. However, with more research, Mr. Recker can continue developing the “Sunlight Harvest Strips” field formation. Environmental issues dealing with water quality and sustainability are hot topics. “Sunlight Harvest Strips” show promise in their ability to reduce nutrient loss to the water system. By continuing a partnership with Dr. Kaleita, of the ABE Department, Mr. Recker can move forward with the environmental effects of new farming methods. Chandler Bane, Mitchell Hora, Gabe Lorack, Nick Lane, Joseph R. Vanstrom and Jacek A. Koziel. Harvest the Sun, Build the Soil. Final Report. TSM 416 Technology Capstone Project, April 28, 2017.